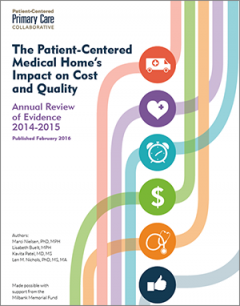 The Patient-Centered Primary Care Collaborative (PCPCC) has released a new evidence report that looks at the effectiveness of the patient-centered medical home (PCMH). Published with support from the Milbank Memorial Fund, the fifth annual report highlights studies of 30 primary care PCMH initiatives from around the country published last year that measured cost and utilization of service—and analyzes the findings. The report also describes the payment model for each initiative and the implications of Medicare payment reform. This year’s evidence report finds more high-quality evaluations being performed, and more positive outcomes. In addition, for the first time three formal evaluations of federal primary care transformation—or PCMH—were included. Findings for these comprehensive reviews were mixed and preliminary, because of the limited and early nature of the data available. Why is the evidence report so important this year? The federal government, as part of the law that ended the Sustainable Growth Rate formula, is in the process of defining the future requirements for status as a PCMH—and enhanced Medicare payments. Also, federally-supported programs—such as the Multi-Payer Advanced Primary Care Practice (MAPCP) demonstration and the Comprehensive Primary Care (CPC) Initiative—are about to come to their scheduled termination date at the end of 2016, just when the programs are beginning to show results. Controlling costs, providing the right care Most of the published evidence indicates that PCMHs reduce health care costs and unnecessary utilization of services. More mature medical home projects showed greater improvement. PCMHs that participated in multi-payer collaboratives showed the most impressive costs and utilization outcomes. Payment reform is key to delivery system change Alignment across payers and decreased emphasis on fee-for-service payments are critical. While several payment strategies are being tested, the evidence did not point to a single payment strategy that was the most successful. Measurement for PCMHs must be aligned and focused on value for patients, providers, and payers The PCMH definition, as well as measures to implement, recognize, and evaluate, must be aligned and demonstrate value.